Tumble polishers for intra-ocular lenses are available in a range of sizes, in single or multi-tiered options. They use a simple but safe and robust operating principle, allowing for total control over the tumble polishing process. The rollers are mounted on self-aligning bearings which can be easily moved to accommodate different sized jars. Jar steadies on each tier are fully adjustable for the full lengths of each jar, regardless of jar combinations. All the polishing machines are solidly constructed from fabricated steel with individual drives and controls to each tier. The tumble polishers offer variable speeds and duration timers. The seated motors come complete with thermal overload protection. 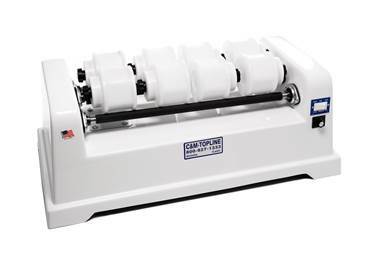 The multi-tier polishers have an optional mesh cover, which improves safety if the tumble polisher is placed in an exposed position in a laboratory. Jars are available in a variety of jar sizes. All jars are white porcelain, of inert, iron-free, acid-proof material. This allows easy cleaning and ensures the prevention of any form of contamination. * Highly polished white fiberglass base. Designed for easy clean up. * Made for industrial and laboratory applications. * Solid steel bars cast in high quality urethane. All three bars are belt driven and fitted with ball bearings. * Available in 120 volts 60 hertz or 220 volts 50 hertz for export. * Rheostat speed control, select any RPM. Two and three tiered tumble polishers are available for a wide combination of jars. Size: Length: 80 inches (2032 mm) long. Height: 60 inches (1524mm). Controls;- An independent stop/start switch with overload protection is provided to each tier with drive indicator neon. An operator safety key operated locking switch is included in the control panel to ensure only authorized operation. The machine is also fitted with an emergency lock/off stop button situated for easy reach by the operator.